We offer both interior and exterior painting services for residential and commercial clients. No job is too big or too small and we work to deadlines. Have a painting emergency (is there such a thing?)? No problem! Give us a call and let us help. 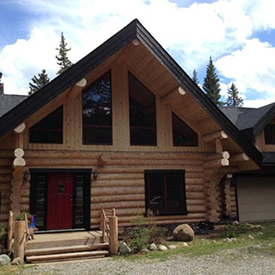 We are accomplished Calgary painters who specialize in the areas of interior walls and trim, exterior trim and siding, staining decks and fences. We also use a number of Calgary brand paints including Benjamin Moore, General Paint and Sherwin Williams. Jonah and Jessie (J&J) are a happily married couple. Jessie is a flight attendant and does all the bookkeeping and accounting. She was born and raised in Calgary Alberta. Jonah is a Journeyman painter with over 15 years of experience. He is from California and is proud to now call Calgary his home. Painting stucco and siding using an airless sprayer. Trim and doors are done by hand. We sand, scrape and prime all surfaces when necessary. We also power wash the entire house, making sure all surfaces are clean and ready to paint. Sanding and filling holes included in price. Walls rolled out evenly, lines cut in straight. Floors and furniture covered to protect from any paint drips. Difficult to reach hallways and entrances are no problem. 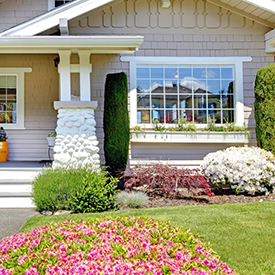 Your house is guaranteed to look new when we are finished. 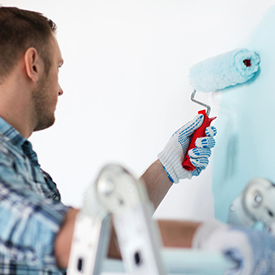 About J & J Painting Co.
Are you in need of a professional painting company that will not only show up on time but will get the job done right? You are in luck because that’s the foundation our business was built on. We are reliable, dependable and professional, all while having fun at what we do. Our years of experience shine through every part of your project, from planning to clean-up. We offer a free consultation and quote, so you can get the best service for the price you want. With 15+ years of experience to back us, we know the ins and outs of painting. We possess a wide variety of specialties and can manage any project, big or small. It all begins with a FREE consultation and quote. The price we give you in the estimate phase is the price we’ll stick to (as long as the project scope remains the same). We’re up front with our costs and how long we expect the job to take. We guarantee there are no surprises along the way! With our years of experience and meticulous approach to painting we get right down to the details in our work. We are an established business, and as such are both licenced and insured in the work we perform. We are also WCB insured. Our quality of work is as important to us as it is to you. We work to make sure everything is up to your standards before we finish your project. Call or E-mail Us for a No Obligation Estimate. E-mails Returned Within 1 Business Day.